Harry Lewis Nelson is a mathematician, computer programmer and expert, math editor, and devoted puzzle inventor. Nelson earned his degrees in mathematics from Harvard (1953) and the University of Kansas (1957). For 30 years, since 1960 until 1991, he worked with supercomputers at the Lawrence Radiation Laboratory / Lawrence Livermore National Laboratory (LLNL) in Livermore, California. Harry and his wife Claire live in Livermore, California. They have four children and nine grandchildren. The 27th Mersenne Prime found by Harry Nelson and David Slowinski. In April of 1979 Harry Nelson and David Slowinski with their computer program found the 27th Mersenne prime, 244497 - 1. It consists of 13,395 digits (almost two times more than the previously known, biggest Mersenne prime) and was the largest prime number known at that time. In early 80's Harry Nelson teamed with Robert Hyatt and Albert Gower, and in 1983 and 1986 they won the World Computer Chess Championship with their chess program Cray Blitz. Cage and Ring Puzzles. The first puzzles produced by Minimax Game Corporation..
Harry Nelson has a longtime interest in nice puzzles of all kind and puzzling1. For five years he has been an editor for the Journal of Recreational Mathematics (JRM) and remains in the journal’s editorial board. Many of his puzzle creations have been presented in puzzle periodicals (including JRM) and events, and manufactured. Now on the market there are about two dozen puzzles and games developed with Nelson's participation and ingenious input. 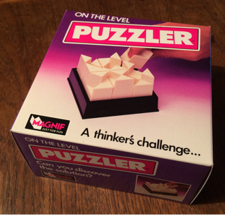 In 1972 Harry Nelson founded the Minimax Game Corporation, a small company helping puzzle creators develop and bring different puzzles to market. Since 1991, after his retirement, Nelson is fully devoted to Minimax Game and puzzle business. He is an active investor to Puzzlium, the first puzzle social network. 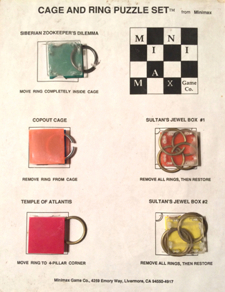 Cage and Ring Puzzles. The object is to get rings into required positions. The MacMahon 24-tile Puzzle Set. All possible, three-colored square tiles make this set. Nelson Puzzle. These four cubes create many different 3-D shapes..
One day Harry Nelson posed a task about the MacMahon 24-tile puzzle set*: Is that possible to create four cubes of this set so that (a) all the tiles touch each other with the same colors and (b) the resulting cubes can form different 3-D shapes in which the cubes touch each other with the same colors? These rather hard tasks were successfully solved by Nelson's son, Scott (at age 9), in 1970. And so a great puzzle was born! The Scott’s invention was patented and manufactured. Nob Yoshigahara has converted the English version of the puzzle into the Japanese version and introduced it into the Japanese market. Nelson Puzzle. Different 3-D shapes to be created with four cubes. 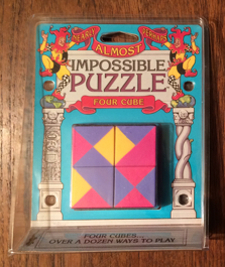 Four Cube Puzzle. A Binary Arts version of Nelson Puzzle. This is an unaltered version of Nelson Puzzle, released by Binary Arts Corp. (now ThinkFun, Inc.), 1996, in their Nearly Almost Perhaps Impossible Puzzle line of puzzles and games. On the Level. Build the city block with levels. Another day Harry Nelson noticed one wonderful feature of the MacMahon 24-tile puzzle set: It contains exactly nine tiles colored with three different colors each. Hence the question: Is that possible to create a 3x3 square of this subset so that all the tiles touch each other with the same colors? It has turned out that it is possible to do two different ways, symmetric and asymmetric, and yet another great puzzle was created! 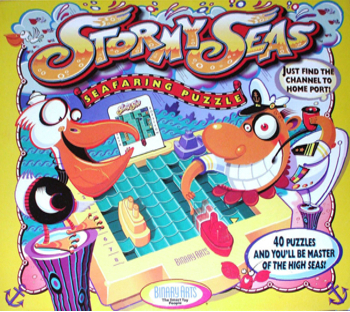 Scott Nelson was actively involved with this puzzle, and his patent includes it as well. In its final design each of the three colors has got its own level, so the puzzle looks like a city block with buildings of several levels. And hence its name. 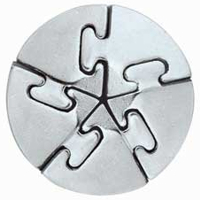 The puzzle is manufactured by Magnif. Gravity Well. Disassemble and then reassemble the shape. It is a nice (though difficult) take-apart puzzle. Your goal is to disassemble the whole shape into three rings and a core, and then to reassemble the shape. Manufactured and sold by Bits And Pieces. Cast Spiral. Disassemble the shape into five pieces and then get them together. This puzzle is based on Ken Walker's innovative 4-piece Jig-saw Puzzle. Harry Nelson suggested to develop an advanced version of Ken’s puzzle with five pieces. This version is manufactured by Hanayama Toys Co., Ltd. since 2003. Don’t Fence Me In. White to move and win. 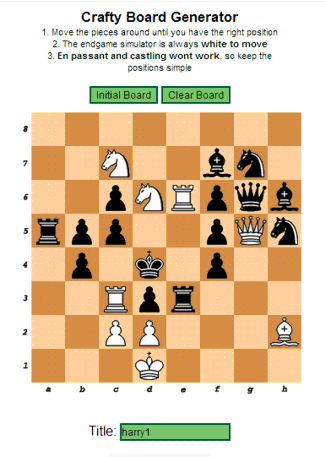 This is a unique and definitely one of the hardest chess puzzle ever – it took Harry Nelson ten years to create it! White to move and win. Sounds quite simple, but just give it a try! The puzzle was compiled in Crafty Board Generator and published in George Koltanowski's famous Daily Chess Column in San Francisco Chronicle. Stormy Seas. Navigate your red boat to home dock. Nelson and Yamamoto have been working on different puzzle projects for two decades. The object of this nice puzzle from their creative workshop is to navigate your red boat through the channels and back to home dock. Released by Binary Arts Corp. (now ThinkFun, Inc.) in 1997. Treasure Quest. Find a hidden treasure. This puzzle is based on Sokoban or Japanese Warehouseman-style online puzzles. It comprises a board with special pieces and a set of challenges on cards. 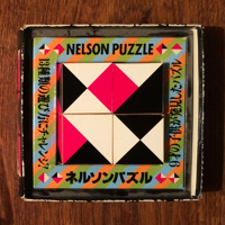 The puzzle was designed by Harry Nelson with the encouragement of Nob Yoshigahara. Challenges by Serhiy Grabarchuk Jr., Hiroshi Yamamoto, and the game designer. Special thanks to Serhiy Grabarchuk Jr.’s testing group including Peter Grabarchuk. Manufactured by ThinkFun, Inc.
Harry’s Nails. Balance different sets of nails on one another. 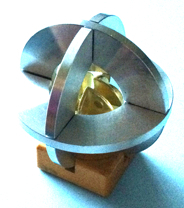 This puzzle was presented at the 21st International Puzzle Party (IPP21) in Tokyo, August 2001. The puzzle idea by Harry Nelson with nail modifications by Rick Irby. There are five puzzles. The object is to balance increasing numbers of the nails on one another in a free-standing structure. When a solution is reached, only one end of a nail may be in contact with the table surface. Cloth is used to protect the table from falling nails. Lunar Lockout. Maneuver the red spacepod to the center of the grid. by Hiroshi Yamamoto et al. This puzzle was developed by Hiroshi Yamamoto and further refined by Nob Yoshigahara. Harry Nelson along with Goro Tanaka and Mine Uematsu (the NOBrain Corps), developed the rich set of challenges for this unusual puzzle. The object is to maneuver your red Spacepod Xanadu, assisted by the Helper-Bots, to the center of the Mothership's Landing Grid. Manufactured by Binary Arts Corp. (now ThinkFun, Inc.). Pohaku. A set of puzzles and games with 24 colored tiles. 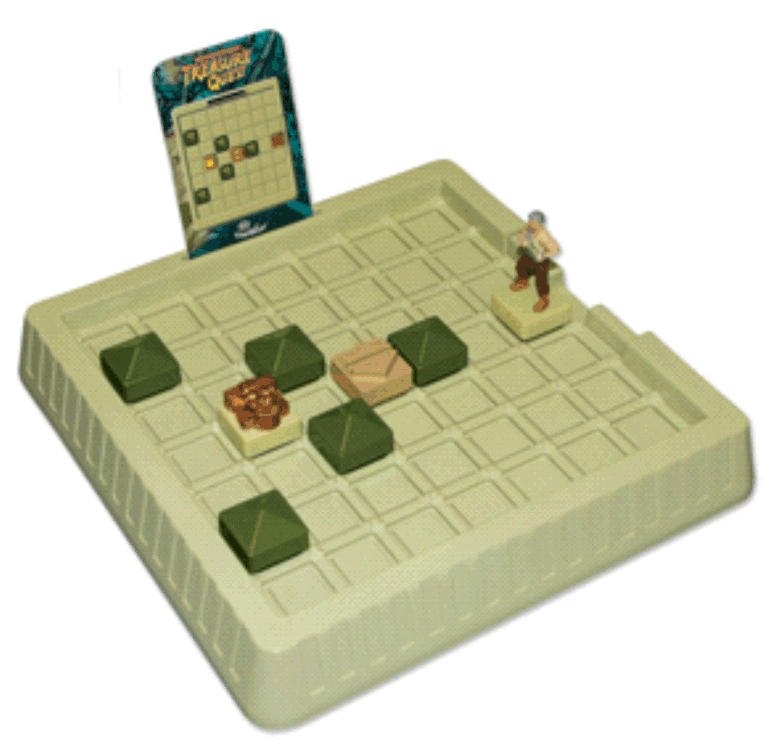 Harry Nelson has developed this unique set of strategy games and puzzles playing with the MacMahon 24-tile puzzle set. He has extended its challenges and created an innovative gameplay. 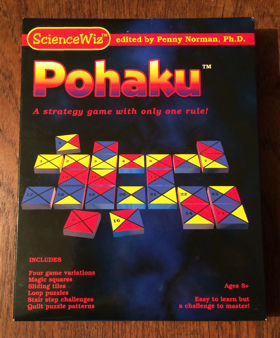 Pohaku contains a book with more than two dozen different puzzles – including puzzle patterns, sliding tiles, and magic squares – and four game variations for two and more players. Manufactured by Norman & Globus, Inc. in their ScienceWiz line. Cool Circuits. Create different closed circuits with eight pieces. This is another puzzle from Nelson-Yamamoto’s creative team. 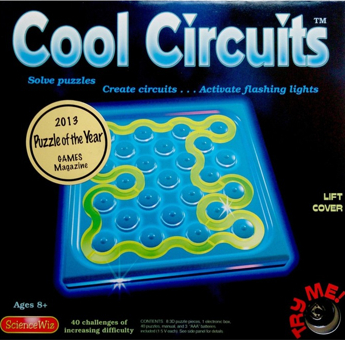 The puzzle comprises a light up board, 8 fluorescent, 3-D puzzle pieces, and 40 cards with different challenges ranging from student to expert. The object for each challenge is to create a closed circuit. Once you do that, the board will light up! Manufactured by Norman & Globus, Inc. in their ScienceWiz line. Puzzle of the Year for 2013 in GAMES Magazine. *) Copyrighted materials are used here with permission. All the remaining parts are copyright © by Serhiy Grabarchuk. 1) Harry Nelson hosts Bay Area Puzzle Parties for decades. One of these Parties was hosted by Nelson in 2010. 2) A British mathematician, Percy Alexander MacMahon (1854 – 1929), has developed this colored set of squares, as well as many other similar sets with different polygons and cubes, and published them in his classic book, New Mathematical Pastimes, 1921.